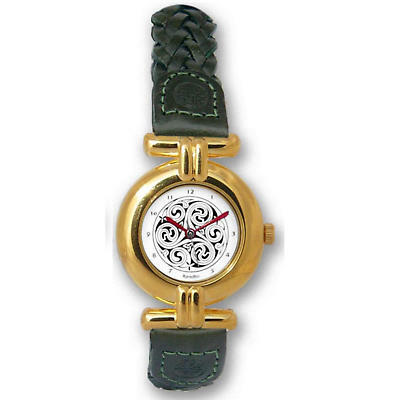 Pressina Trinity Knot Celtic Watch. Ladies, two-tone shiny and matt silver-plated bracelet with Trinity love knot in relief. 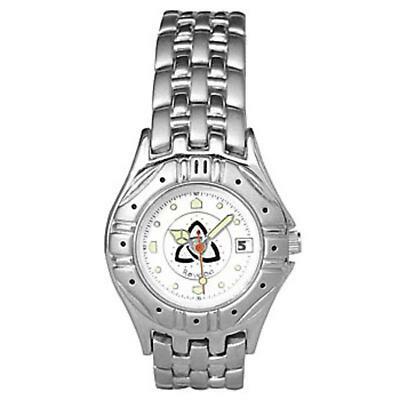 Nickle free and dustproof construction, 3 year battery, Japanese quartz movt. White dial with embossed silver Trinity Knot. A lovely French faery of the fountain, fell in love and married King Elinus of Albany. She married him on condition that he did not come near her when she was 'lying-in'. When he heard that she had given birth to triplet girls he forgot his vow and rushed to see her. Pressina took the girls and fled to the 'lost island'. 15 years later the girls took their revenge on their father by permanently trapping him in a cave, however Pressina was so annoyed at this that she cursed the girls. Her most famous daughter was Melusine, and her curse was to become half a serpent every Saturday. Triskel: (Trinity or Love Knot) The design on the links is one of the basic Celtic designs. The circles represent the three domains of ancient Celtic belief: the underworld for the past, the earth world for the present, and the sky world for the divine.